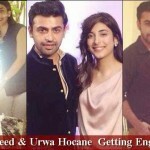 Here we will discuss the latest news that Urwa and Farhan Saeed are getting engaged. 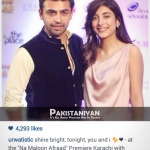 Firstly, we would like to mention the brief introduction of urwa and Farhan Saeed. 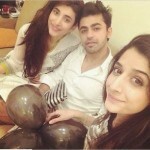 Firstly, Urwa Hocane is a well known and talented television actress. In a short span of time, she is getting very popular because of her acting. Till now, she worked in many drama serials. Moreover, recently she worked in movie named as Na Maloom Afraad with Fahad Mustafa. 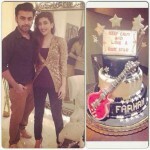 On the other hand, Farhan Saeed is a well known singer. As we know that his popular band is Jal. Till now, he sing so many songs. Recently, he also doing acting in a drama serial. Now lets discuss the main news. These days, Urwa Hocane and Farhan Saeed are talk of the town. Moreover, they are also spotted on different fashion shows, awards shows and movie premiere together. Both the celebrities did not made any announcements but she posted a picture on her Instagram account with Farhan in which picture shows the cartoon of love birds. We would like to mention that they are not dating with each other, infact they are strongly committed with each other. They are soon getting engaged. 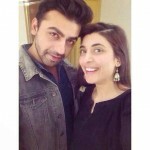 In this post, we will discuss the pictures of Urwa and Farhan Saeed together. 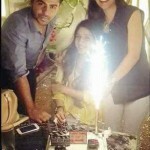 Below pictures completely shows that both the celebrities are involved with each other. We should say best of luck to the couple and hope that they will be getting married soon.